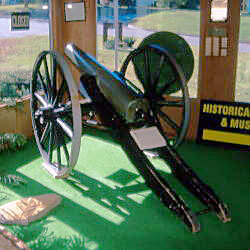 Description: A Confederate 12-Pdr Napoleon cannon, mounted on an inaccurate double trail carriage, is displayed in the inside front entrance of the City Museum. 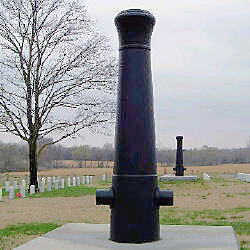 The bronze smoothbore cannon has many dents and nicks scattered over its various surfaces. The local GAR post bought it in Arkansas in 1883. 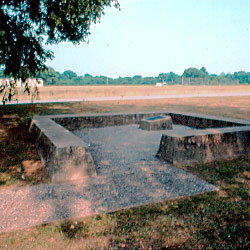 Description: A Brass marker is mounted inside a decorative plaza. The marker is inscribed: "Baxter Springs Massacre ~ 1863 ~ The Blood That ~ Flowed In Kansas ~ Before And During ~ The Civil War ~ Nourished The ~ Twin Trees Of ~ Liberty And Union." 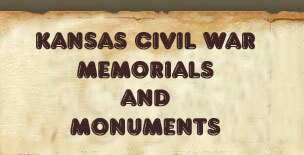 Below that inscription is a dedication to the members of the 1st Kansas Infantry that fell in the massacre. Description: Four iron 24-pounder Siege and Garrison Guns, mounted in square granite slabs surrounding an Eternal Sentinel. The guns are pointed upright with trunnions above ground. Most of the breech section of the guns is buried. The center statue is dedicated to the Baxter Springs Massacre Victims. 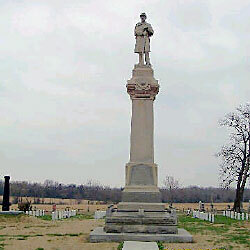 The main inscription reads: "Erected By The United States To The ~ Memory Of The Officers And Soldiers Killed In ~ The Battle Of Baxter Springs October 9, 1863, ~ And Other Engagements In This Vicinity Who Are ~ Buried Near This Monument And Whose Names, ~ So Far As Are Known, Are Inscribed Hereon". Above the main inscription and on the other three sides are inscribed: "3rd Wisconsin Cavalry ~ (38 names)", "Brigade Band ~ (14 names) ~ Civilians ~ (13 names)", "(2 names) ~ 14th Kansas Cavalry ~ (25 names) ~ 78th (?) USCT ~ (1 name)", "2nd Kansas Battery ~ (5 names) ~ 8th Kansas Cavalry ~ (4 names) ~ 2nd Ohio Cavalry ~ (2 names) ~ 83 (?) 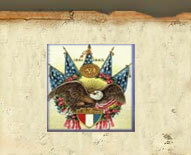 USCT~ (2 names) ~ 9th Wisconsin Infantry ~ (1 name) ~ 12th Kansas Infantry ~ (1 name) ~ 15th Kansas Cavalry ~ (1 name) ". Description: A very detailed individual marker is dedicated to T.J. Losey. 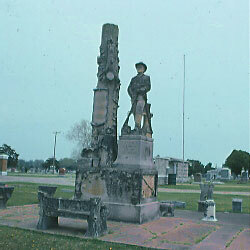 The inscription beneath the statue reads: "T.J. Losey ~ Co A, 14th Kan ~ Vol. Cav. ~ Jan 15, 1936". Below and to the left (on the base) is inscribed: "My Friends As You Pass By ~ As You Are Now So Once Was I ~ As I Am Now So Will You Be ~ Prepare For Death And Follow Me". 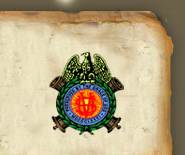 "1861" is engraved below the statue on the right side of the support.